Image, top: Thomas Aquinas is depicted in this detail from the stained-glass window at Saint Joseph’s Catholic Church in Central City, Kentucky. Such portrayals often include a halo around his head and a sun or sun-face medallion on his cloak. Both symbols have ties to ancient sun-worshiping cultures. Among Roman Catholic thinkers, Thomas Aquinas stands out for his integration of Greek philosophy into the dogmas of the church—an approach that has had a profound and lasting effect on the Christian world. Thomas Aquinas (ca. 1225–1274) is one of the foremost figures in the history of Christianity. It’s difficult to say anything about theology’s development over the past two millennia without mentioning him. Few understand, however, just how central he was in Christianity’s progressive deviance from biblical teaching. Born to an aristocratic family in Roccasecca, in what is now central Italy, Aquinas was raised in the Benedictine order. At 14 he was sent to the University of Naples, which was one of a few institutions that taught the works of Aristotle, and this early grounding in the Greek scholar’s writings became foundational to his mode of thought. It was here, too, that he became influenced by Dominican doctrine and eventually joined their order, rebelling against his family’s wishes. Nowadays Aquinas is most often read in terms of his position within the revival of Aristotelian thinking. He represents, for some, a middle way, as a neither unqualified adopter nor opponent of Aristotle’s thinking. On one hand, he backed the new Aristotelian natural philosophy. He argued that, rather than being powerless playthings of a divine order, humans retained agency and responsibility for their actions. On the other, he remained fundamentally a Christian theologian who, rather unconventionally, believed Aristotle a theist. This meant that his breed of thought was a peculiar interweaving of theology and naturalistic rationality. His work was well known during his lifetime, though briefly banned at one point. Aquinas was canonized in 1323 after the requisite inquiry into his life and miracles. Pope John XXII weighed in by declaring that the man’s doctrine was itself a miracle. To understand his writing and its divergence from original scriptural teaching is to understand how far modern Christianity has separated itself from the biblical way of life. 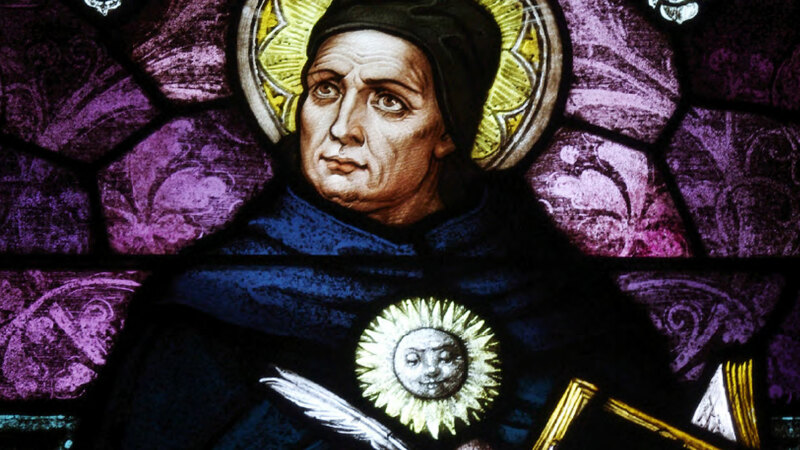 One of Aquinas’s most dramatic impacts was in synthesizing two modes of discovering information: divine revelation and humanly discerned rational inquiry. His was a basic thought: if God is true, and if what humans discern from rational inquiry is also true, then how can they be opposed? He suggested instead that they overlap. In the first place, God reveals certain things that humanity is also able to discover; and for anything beyond that, we rely on divine revelation. The job of philosophers such as Aquinas was therefore something of a mixed endeavor. He extended this undertaking in his other best known work, the Summa Contra Gentiles, which aimed to explain Christianity to those who did not already accept Scripture as truth. To that end, the first three (of four) parts make no appeal to divine revelation at all. It was written on the principle that natural philosophy, where it overlaps with Scripture, can irrefutably confirm it—and thus persuade those as yet unconverted. Central to this were two principles. The first is that rational inquiry, correctly used, will never reveal anything contrary to God. The second is that there are certain truths which rational inquiry cannot prove or disprove; and in such cases we must simply accept God’s revelation as fact. Aquinas’s reasoning is alluring; but what his principles failed to take into account is the slipperiness and elusiveness of human reason (Jeremiah 17:9; 10:23), and that is nowhere more evident than in his move away from the biblical Sabbath. The Sabbath, as outlined in the Hebrew Scriptures, is the seventh day of the week. By Aquinas’s time many perceived it (along with the other holy days originally instituted in the Torah) derogatorily as “Jewish” and consequently tainted with the guilt of Jesus Christ’s death—an accusation that, incidentally, the apostle Paul had addressed in the book of Romans when he pointed out that all, Jew and gentile alike, were (and are) guilty of sin and therefore shared in bringing about Jesus’ death; see Romans 3:9–26. The first day of the week, Sunday, had centuries earlier come to be known as “the Lord’s Day,” and at first it coexisted with the biblical Sabbath. The observance of Sunday, though nowhere instructed in the Bible, initially commemorated what was incorrectly thought to be the day of Christ’s resurrection. Its defenders pointed to its apparent non-Jewishness (though Christ was, of course, of the tribe of Judah) and questioned whether there was anything wrong with a desire to worship twice as much as before. By the seventh century, strict Sunday observance was required. Aquinas’s writings on the matter in the Summa Theologiae did much to conflate the meaning of the two days and ultimately dismiss observance of the original, biblical Sabbath. Since the seventh century, according to Bible scholar Andrew T. Lincoln, there had been “the attempt to give this idea of rest for worship on the Lord’s Day a theological rationale and to make it mandatory on a biblical basis.” It was Aquinas, however, who established “the first full-scale theological justification of Sabbath transference” (From Sabbath to Lord’s Day). In the Summa Theologiae, Aquinas first delineates potential lines of thought antithetical to the Sabbath in four “objections,” which he proceeds to deconstruct and deny. His first line of reasoning is that the Decalogue (the Ten Commandments), is not only divinely given but also in keeping with an underlying natural law. Therefore the Sabbath instruction was not only as important as any of the other commandments but also, critically, a principle that could be discerned from rational inquiry and therefore not fully subject to divine revelation. This was a thoroughly Aristotelian line of reasoning. The critical aspect is that Aquinas dealt with the biblical Sabbath and the Lord’s Day as one and the same. The implication was that the principle of a day of rest was important, but that the choice of day was not. It was, in effect, a fudging of the terms, a sideways discussion of one aspect that in its process conflated and equated the Sabbath with the Lord’s Day. He appeared to give support for the biblical commandment while replacing its primary aspect—that it be observed on the seventh day—with pagan-derived Sunday worship. Subsequently it was easy, as a result, to dispense with one rest day (as two were redundant), and the “too Jewish” Sabbath was the obvious loser. The influence of Aquinas’s writing is powerfully evident today, not least in this issue. The majority of conventional Christianity observes Sunday while dismissing the seventh-day Sabbath as strictly Jewish. Aquinas’s reasoning in such matters represents an important pivot in the shifting of Christianity from God’s basic truths as revealed in His Word, the Bible. Thomas Aquinas, Summa Theologiae (translated by Fathers of the English Dominican Province, 1947). Thomas Aquinas, Summa Contra Gentiles (translated by Fathers of the English Dominican Province, 1924–29). Simon Blackburn, Oxford Dictionary of Philosophy (1994, 2005). D.A. Carson (editor), From Sabbath to Lord’s Day (1999). Julian Marias, History of Philosophy (1967). Thomas Mautner (editor), Dictionary of Philosophy (Penguin Reference, 1998, 2005). Bertrand Russell, History of Western Philosophy (1946).